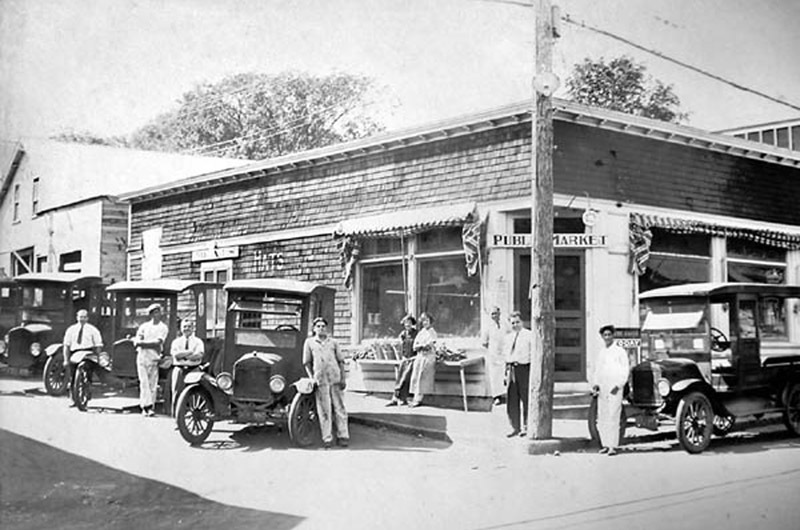 On the corner of Main street and Church street in the 1920s. Cronig’s Market, which celebrates its centennial today, is the first Vineyard business to take advantage of a new online advertising opportunity the Gazette is making available to institutions on the Island that have stood the test of time. A special timeline of Cronig’s 100-year history, sponsored by Cronig’s Market, has been added to the Gazette’s Time Machine, an interactive feature that lets users browse historical articles, photos and videos from the Gazette archives. You can tour the Cronig’s timeline at vineyardgazette.com/timemachine/cronigs. The Time Machine, launched last year, contains a multimedia look at major events in Vineyard history including reprinted articles, illustrations and photographs published in the Gazette since its founding in 1846. Separate timelines have been created for the Gazette’s most popular collections of historical material, including Presidential Visits, Hurricanes and Steamships and Ferries. New timelines are added regularly. These collections will be expanded and new ones added overtime. The newspaper welcomes suggestions from the public for additional topics. The Cronig’s Market timeline is identified as sponsored content, as it was created with support and input from Cronig’s. Other organizations and businesses that have 50 or more years of history on the Island and would like to sponsor their own timeline on the Time Machine should contact Skip Finley, director of sales and marketing, at sfinley@mvgazette.com. The Time Machine offers just a sample of the Gazette’s rich archive of materials, which includes a microfilm record of every issue of the Gazette, extensive clipping files of topics, people and events, and assorted photographs, letters, manuscripts and other information. For information about the Gazette archive, to research a subject or to tour the Gazette, contact our librarian, Hilary Wall, at library@mvgazette.com. Many years ago, probably in the late 70's, I worked for a company that designed supermarket interiors - particularly for what were called independent stores. One of my first assignments was the interior graphics for the Cronig's on State Road. Being on the Vineyard for a regatta, I took my bike to see one of my designs and was delighted with the results. Not certain if anything I designed still exists but, it's nice to know they are still going strong! As our community grows, so grows the grocery store business up-Island.